Item is a small hand held box camera with Bakelite body, brilliant viewfinder and Kodalite Flash-holder attachment. For 6 x 6 cm exposures on 620 roll film. One of the best selling Brownie cameras ever made, it is a simple easy to use design created by Eastman Kodak employee Arthur H. Crapsey. 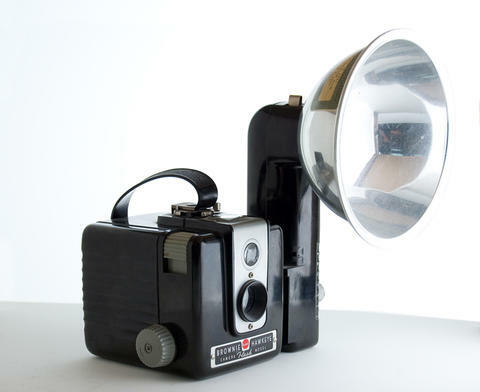 The original sales price was $5.50 for the camera alone and $7.00 for the flash model. Very good. Some scuffing on surface, a little rusted around screws inside flash holder. Donated to Ryerson University Library Special Collections by Glen S. Clifford in 2006. Item is originally from the Glen S. Clifford Dondation, accession number 2006.001. Moved to the Heritage Camera Collection in 2013.